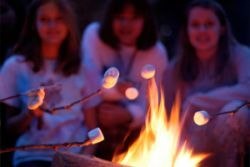 Moraine Activities - Land | Visit Butler County Pennsylvania! A 7-mile paved bike path curves into a forest at Moraine State Park, Pennsylvania.The paved bicycle trail winds near the shoreline between Davis Hollow and the Bike Rental Building in the northwest corner of the park. The trail can be accessed at many places in the Lakeview Beach and Watts Bay Marina areas. This trail is not a loop. The trail has several grades and curves. Please exercise caution and be considerate of other riders and walkers when using this trail. 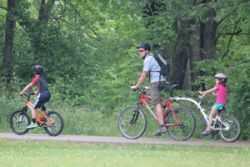 On North Shore Drive, about 1 1/2 miles from PA 422, the bike rental is open from 11 a.m. to 7 p.m. weekdays and 10 a.m. to 7 p.m. on weekends and holidays from Memorial Day through Labor Day. They rent single and multi-speed/geared bikes, tag-a-longs, children's and tandem (two-person) bikes, and also child seats, helmets and child pull behind trailers. Rentals are at your own risk. Neither the bicycle concessionaire or the park is responsible for any accidents or injuries which may occur during your rental. Please ride defensively and be aware of others on the trail. 724-368-9011, if no answer 724-510-5195. Moraine State Park is a great place to spot our feathered friends. Bald Eagles, herons, warblers, ducks and Osprey are among the many species that can be found throughout the park’s nearly 17,000 acres. The waterfowl observation deck is a nice sheltered area to watch bird life. The observation deck is accessible from Rt 528 near Prospect. Learn about Osprey reintroduction while appreciating the gorgeous scenery and wildlife on the Nautical Nature, a 45-passenger enclosed pontoon boat operated by Moraine Preservation Fund. The Link Road Overnight Shelter on the North Country National Scenic Trail is available to backpackers by reservation only. Eleven modern cabins are available for rent year-round. These electrically heated cabins sleep six people and have two bedrooms, bathroom with shower, kitchen, dining/living area and a dock on Lake Arthur during the summer season. Renters must provide their own linens, towels, cookware and tableware. Play equipment for children is in a central area. Cabin 11 is ADA accessible. Dogs are permitted in cabins 7 and 11 for a fee. There are two tent camping areas available for organized groups: Muskrat Cove and Five Points. These rustic camps have picnic tables, cooking grills and water, but no showers. Advance reservations are required. Pleasant Valley and Sunken Garden trails are groomed when snow conditions permit. The trails are blazed with yellow and pink and are suitable for all skill levels. Moraine State Park offers a wide variety of environmental education, interpretive and recreational programs. Through hands-on educational activities, guided walks and evening programs, participants gain appreciation, understanding and a sense of stewardship toward natural and cultural resources. Programs are offered year-round. Teacher workshops and educational programs for students are available. Please contact the park office or go to www.visitPAparks.com for more information. The park is open for geocaching 8 a.m. to sunset. Search 16051 on www.geocaching.com for locations. To place a cache, approval and a maintenance agreement is needed from the park office. GPS units can be checked out with valid ID if not in use for educational programming. There are 28 miles of trails. The hiking trails of Moraine State Park wander through forests and grassy areas, along lake edges and past wetlands. For your safety and to protect the resource, please stay on the trails. For the safety of all park visitors, please keep dogs leashed and under physical control at all times. Glacier Ridge Trail is a part of The North Country Scenic Trail. A great overview of the park's trails is available here through Moraine Preservation Fund. 20 miles of equestrian trails are in the southwest and east sides of the park. Riding is limited to designated trails and roadsides throughout the park. About 13,600 acres of Moraine State Park are open to hunting, trapping and the training of dogs during established seasons. Common game species are waterfowl, deer, turkey, grouse, bear, rabbit, pheasant and squirrel. No hunting areas are posted. A map is available at the park office showing portions of the park open to hunting. No hunting areas are posted. Hunting woodchucks, also known as groundhogs, is prohibited. Dog training is only permitted from the day following Labor Day through March 31 in designated hunting areas. The Department of Conservation and Natural Resources and the Pennsylvania Game Commission rules and regulations apply. Contact the park office for ADA accessible hunting information. A 6-mile loop trail for mountain bikes is on the North Shore. Trailheads are located off of Mt. Union Road and Alexander Ridge Road. This technical trail is for experienced off-road riders in good physical condition who have equipment for off-road riding. It was named one of the most technical mountain bike trails in the world! 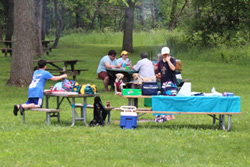 Picnic tables, charcoal grills and restrooms are located throughout the day use areas and marinas. Some facilities are ADA accessible. Seven picnic pavilions may be reserved up to 11 months in advance for a fee. Unreserved picnic pavilions are free on a first-come, first-served basis. All picnic areas are open from sunrise to sunset. A very popular sledding area is near the Pleasant View Picnic Area on the South Shore. Conditions permitting, 26 miles of trails in the north and west portions of the park can be snowmobiled. There must be at least six inches of snow on the paved bike trail. Studded track snowmobiles are prohibited on the paved bike trail. Please refer to bulletin boards for additional rules and regulations for snowmobiling. Snowshoeing is recommended at Jennings Environmental Education Center since cross-country ski trails are not groomed. However, snowshoeing is permitted at Moraine on designated hiking trails. Hikers must stay off to the side of groomed trails so as to not break up the set track.